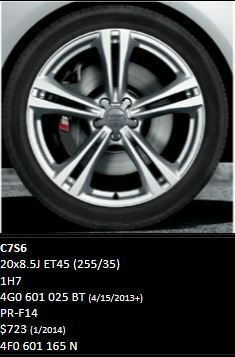 I'm shopping for a winter tire/wheel set for my RS7 and I have a question. My dealer tells me that the wheel offset on my 21" set is +35; however, I've read on the forum that others are looking at 20" set-ups for winter with a +29 offset. Which is correct? Does anyone have a definitive answer? you are not too far from tire rack in South Bend, an awesome place. They have some great advisors there. My RS is coming in the 2nd week of Dec, due to a little order glitch on my part it is coming with 20" stock rims, I will be swapping out the tires for pirelli sottozero SerieII upon delivery. the dealer is giving me credit for the summer rubber and selling me OEM 21" rims/rubber for summer at dealer cost. I am very excited. Maybe I'll see you out in the city sometime, we come downtown a few times a month from northwest indiana. Hello, off topic. Your 2012 A7 had Stasis performance package. Is the RS7 much more overwhelming compared to you A7? I would love to be able to trade my 2012 A7 and get a RS7 but I don't know if the $30-$40K price difference is worth it. Yes, the RS7 is a quantum leap over my Stasis A7. It's more than a second faster in 0-60 time, but the 60-130 acceleration is almost unbelievable. I'm just finishing my first 1000 miles (yes, that was quick), and I'll post it on this forum over the weekend. As for trading in, depending on mileage, you'll be spending more like $55-$65k plus your A7......unless you buy an RS7 with virtually no options. Mine has most of the available options and stickered at $122k. I don't have access to any database, the ones I can access don't have RS7 in the list. I just spoke to my Audi dealer who was selling me the winter wheel package. That uses the 20" double spoke alloys and they are ET35 offset and width is 9". Is this what you're looking for? The ET 46 offset is small, I think it would look funny to be 11 MM in, the 35 are already less than optimal optically in my opinion, I'm pretty sure the 21" are ET 29 or 25. I'm rolling dedicated 20" snows that are 9", ET29 . Hope that helps. I went with a set of 20" Hartmann wheels with an offset of ET25. I have a set of these 20" wheels from the S6 I had for about 6 Months (I bought them from someone here). If you are interested for your winter set let me know. I was told by dealer they will fit my new S7 but I don't think I will be swapping winter/summer. Let me know.